This is a shot of Dante when he was about 8 months old. 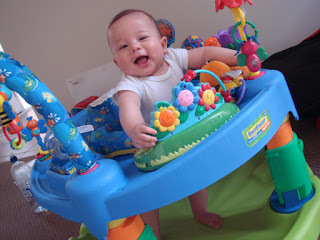 I decided to take photos as he seemed so happy playing in his ExerSaucer bouncer. awwah!! this is the cutest picture ever..
hey girl thanx for tagging me hihi :) though am finished with this tag ..your baby is super cuutee mmmwah :D ..
Hi! I'm a new follower =) I gotta say..your little boy is super cute!! He looks so adorable :D.